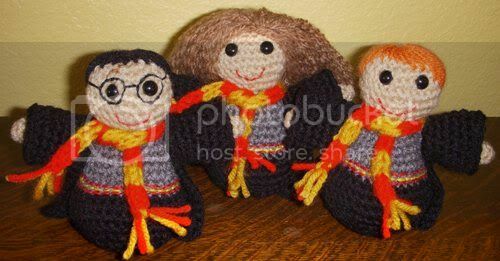 I made these five Harry Potter amigurumi dolls for a friend and her kids who all love the series. I had a lot of fun making them though they took much longer than I expected. Part of that may be because I was trying to made a duplicate set of dolls for myself at the same time because I knew if I didn't make them then, I never would. Unfortunately when we decided to move I had to rush to finish them and didn't get to make Dumbledore or Hagrid for myself. Since I don't own the rights to Harry, I can't post a pattern. However, I will explain some of the basic techniques I used to create the dolls. I ended up doing a few new things for these dolls that I had never attempted before. The bodies: I used a basic mushroom body shape, like the body I made for my Nativity dolls. Hagrid needed to be bigger so I added stitches to make him fatter and added extra rounds to make him taller. 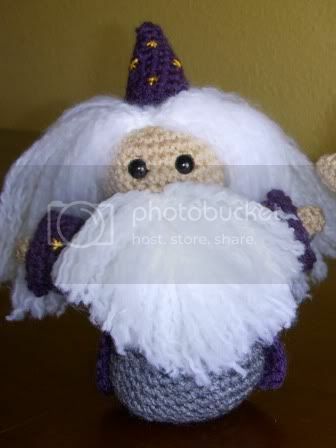 For Dumbledore, I didn't add extra stitches but I did add extra rounds. The hair: This was my biggest challenge as I had never done hair on an amigurumi doll and it took a lot of experimentation. 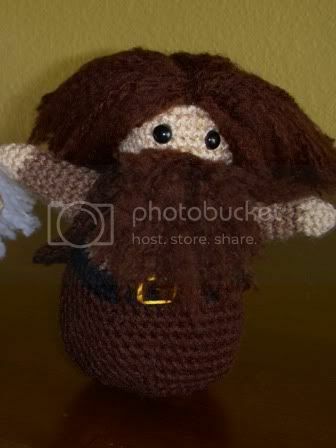 I think I will do a separate post with photos of the methods I used, but for now I will summarize by saying that for Hermione, Dumbledore and Hagrid's hair as well as the two beards, I crocheted a "wig cap" then threaded yarn through the spaces between stitches. I put glue on the underside of the cap so the hair wouldn't get pulled out. I pulled apart the strands of each yarn then used a wire brush to gently brush the yarn so it got fuzzy (except for Hermione, I didn't brush her hair out). I then attached the cap to the head. For Harry and Ron, I embroidered the yarn directly on to their heads. The robes and Hagrid's vest: I started with my pattern for Joseph's robes and just added sleeves by picking up stitches around the arm holes and then crocheting in a spiral until they were long enough. Hagrid's vest was a short version of the robe without sleeves. Scarves: I experimented with crocheting and knitting ties and scarves out of embroidery floss but when nothing turned out how I wanted, I switched to regular yarn and a homemade four-stitch knitting Nancy to make the i-cord scarves (this could also be done by using the double pointed knitting needle method, see this video). Details: The faces and details were embroidered with embroidery floss. The eyes were safety eyes. Dumbledore's hat was a simple cone. Hagrid is the best! Awesome dolls! You can't even post the pattern if you are not profiting from it? I could understand if you were trying to seell them on etsy... but bummer! 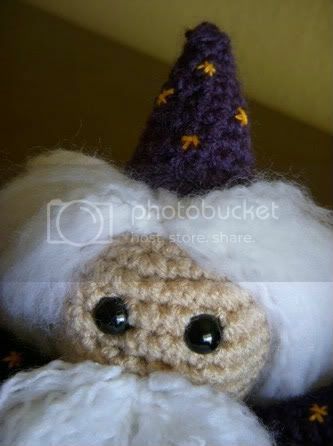 I'm sure JK Rowling isn't out trolling the internet for crochet pattern copyright infringement so I could probably get away with posting them but, as I understand it, if she or Warner Bros etc. did find them they would be within their rights to ask me to take them down. I don't want to mess with that possibility.